What a sweet floral tribute! The royal wedding bouquet held a very special meaning for the Duke and Duchess of Sussex. Prince Harry hand-picked flowers from their private garden at Kensington Palace to add to his bride's bespoke bouquet, which was designed by florist Philippa Craddock. The bouquet featured forget-me-nots, the favorite flower of Harry's mother, the late Princess Diana. In the traditional language of flowers, forget-me-nots symbolize true love, making them a perfect choice for the newlyweds in every way. The myrtle sprigs carried a lot of tradition. They were cut from stems planted by Queen Victoria in 1845. Queen Victoria’s eldest daughter, Princess Victoria, was the first member of the royal family to carry myrtle from that plant. Queen Elizabeth also carried sprigs of myrtle in her wedding bouquet in 1947. 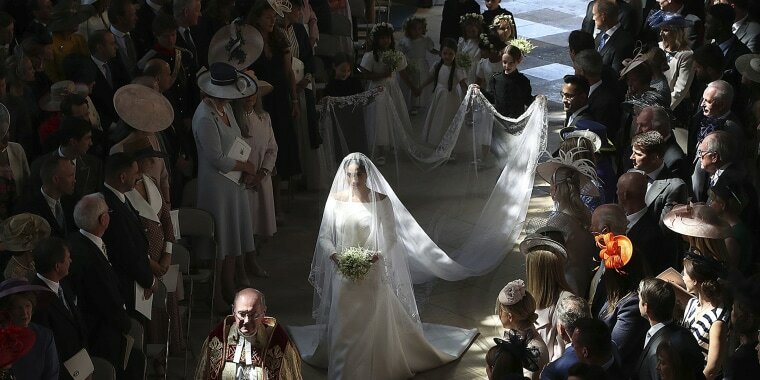 The bridesmaids’ flowers replicated the flowers used in the Duchess of Sussex’s bouquet. What a beautiful way to honor the late Princess Diana during the ceremony!